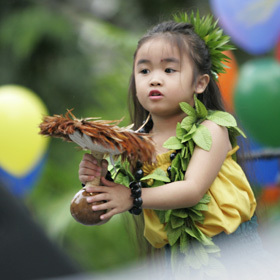 WEEKEND SCENE » During the fourth annual Spam Jam Festival block party along Kalakaua Avenue in Waikiki on Saturday, visitors and locals alike enjoyed entertainment, food and crafts. Kiana Ogawa, above, and other members of the halau Na Opio O Koolau danced hula on the Diamond Head stage. The nighttime facility is at an undisclosed location in Honolulu. Legislation would condemn the complex in order to keep it affordable. Chris Piper finds that quilting helps ease life's stresses and used it to relieve frustrations while serving in Iraq. Harrington's complete game and Avila's homer put Hawaii atop the league by a half-game. Daniel Gibson can give you the lowdown on how to buy drums. State House and Senate judiciary chairwomen have agreed on a bill to relax state restrictions on wiretaps. A report has concluded that military sonar noise was the probable cause for stranding whales.